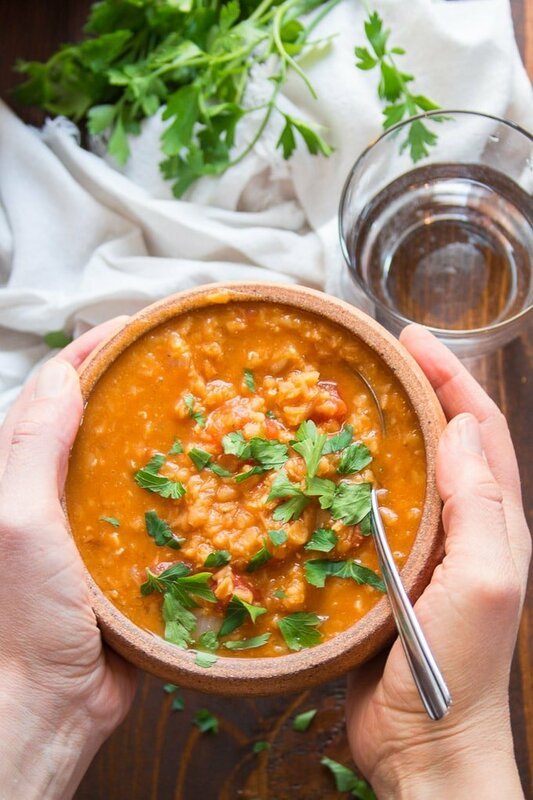 Super easy, healthy, and incredibly delicious, this cozy red lentil soup is seasoned with Mediterranean spices and a touch of harissa for some kick! 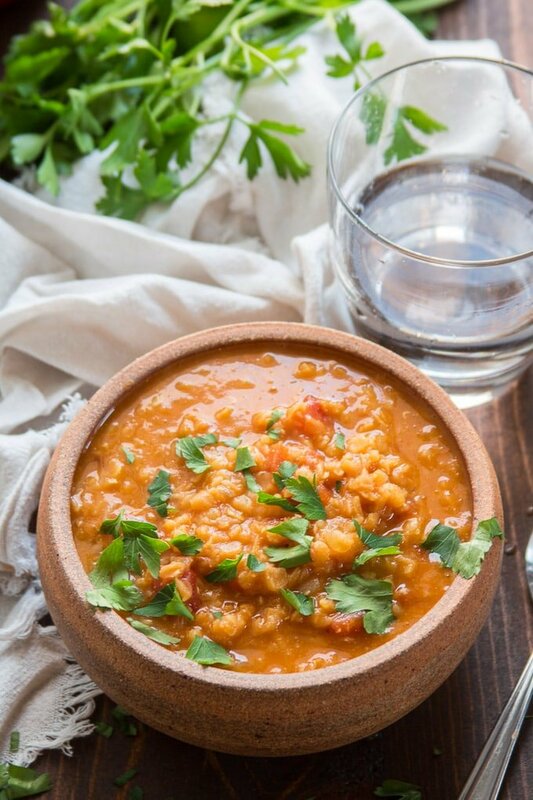 This naturally vegan and gluten-free soup is perfect for chilly evenings. This soup was one of my favorite things to cook when I was in law school. It’s go so much going for it! For one thing, it’s a pretty cheap meal (and funds were low back then). For another, the quick throw-stuff-in-a-pot-and-let-it-simmer approach to cooking was perfect during exams time. I wasn’t the only one that was a big fan of this soup back then. At some point a mouse moved into the kitchen of the house I was renting, residing somewhere beneath my oven. Whenever this soup was cooking, he’d pop his little head out of one of the burners that weren’t then being used and turn his nose up in the air, sniffing away. I didn’t really mind. It was cute and I took it as a compliment. I did get a little nervous at times that I’d light a burner without realizing he was approaching, so I got in the habit of banging on the stove top to scare him away before lighting up, just in case. We eventually did have to relocate the mouse and his family. I just wasn’t comfortable with the thought of them scampering all over my dishes and utensils while I wasn’t looking. I’m happy to say that we caught them all with humane traps and relocated them to Philadelphia’s Fairmount Park, where they (as far as I’m concerned) lived out the rest of their little mouse lives happily. 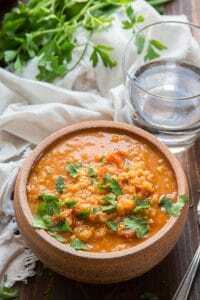 I love the flavor and texture of split red lentils, but they’ve also got the advantage of quicker cooking time compared to other types of lentils. About 20 minutes of simmer time is all it takes for these lentils to completely soften up and fall apart. 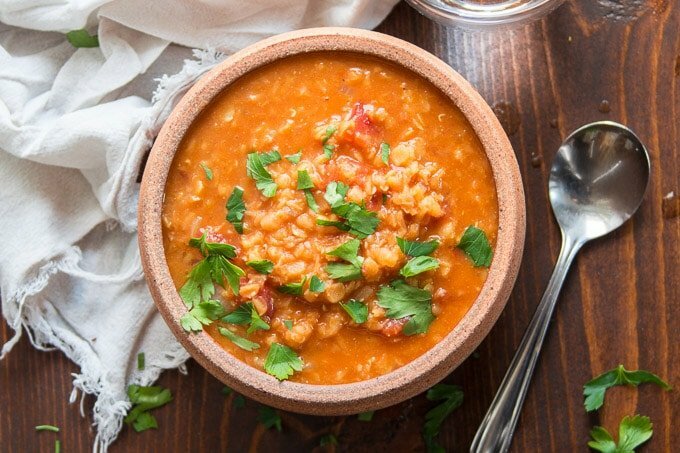 Make sure your red lentils are split. Usually the ones available at supermarkets are, but occasionally I come across some that aren’t. 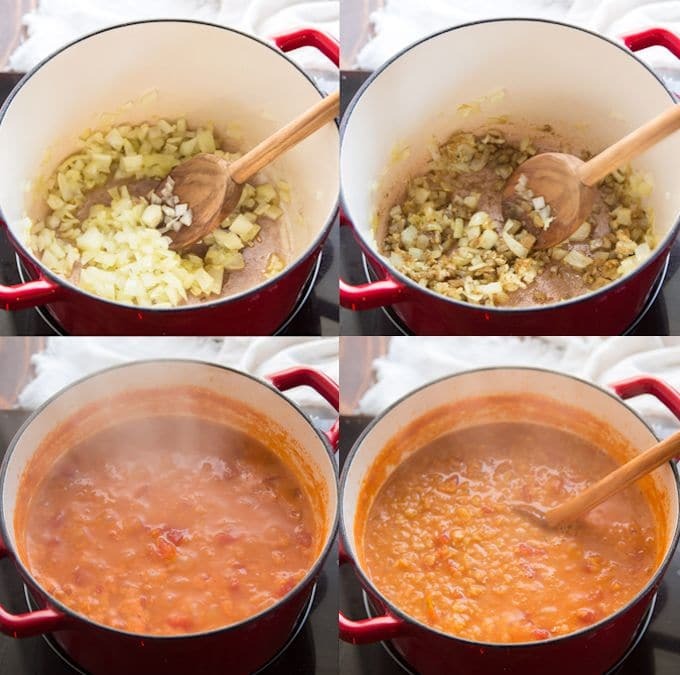 If your lentils aren’t split, they’ll take much longer to cook, and your soup will have a completely different consistency. Start by sautéing some onions in olive oil. Give them a chance to soften up, and then add some garlic and spices. Sautéing the spices for a minute (but no longer!) brings out their flavors. Finally, add some broth, tomatoes and your red lentils. Let everything simmer for a bit, until the lentils are soft. Add a squeeze of lemon juice. If you like your soup on the spicy side, stir in some harissa paste at the end. Feel free to adjust the spices and seasonings to your liking. Use more harissa if you like extra kick, or leave it out if you’re not into heat at all. Is this soup gluten-free? It sure is! Leftovers of this soup keep very well for about 3 days in the fridge. The soup may thicken up a bit over time, but I personally like that! If you don’t, just thin it with a bit of broth or water. 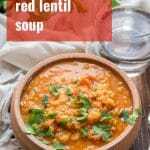 Can I make this soup with another type of lentil? Perhaps, as long as the lentils you use are split. If they’re not split, the tomatoes could prevent them from cooking fully. Check out my video to see just how easy this soup is to make! Heat the olive oil in a large saucepan over medium heat. Add the onion and cook, stirring occasionally, until soft and translucent, about 5 minutes. Add the garlic, cumin and coriander, and sauté for another minute, until the garlic becomes very fragrant. 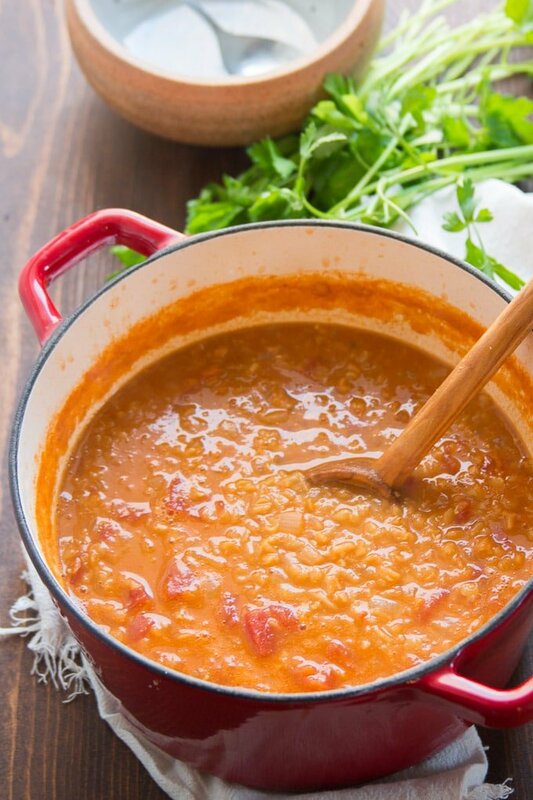 Stir in the lentils, broth and tomatoes. Bring the liquid to a boil, lower the heat to a simmer, and allow to continue simmering, uncovered, until lentils are soft, about 20 minutes. Thin the soup with some water if it becomes too thick while simmering. Stir in the lemon juice and harissa (if using). Season the soup with salt and pepper to taste. Ladle into bowls and top with parsley and/or cilantro. This looks absolutely amazing! All I have to do is find someplace that carries Harissa.. Thank you! This is fantastic with harissa, but if you have a hard time finding it you could sub your favorite hot sauce. I’ve also seen a few recipes online for DIY harissa, but haven’t tried myself yet so I can’t say if they’re any good. Enjoy!! I absolutely love the mouse story. We are the same in our house. We have cats who catch the mice, bring them to us and we then take them out to our shed and release them. A few days/weeks later the story repeats. Our son has suggested marking these little guys so we can tell if they are repeats or just new kids on the block looking for a warm,dry home. I have long been a fan of your recipes and life values. Thanks for all the delicious recipes and heart warming life style. This soup is AMAZING ! I have made this 2 times in the past. Tonight I am making a double batch and freezing some. It is one of my family’s favorite soups. The Harissa adds so much to it. Delicious! Made it for supper… the kids loved it, too, sans harissa. Wonderful! Glad you all enjoyed it!! Oh my gosh, that’s crazy! Smart of your dad though and I’m glad it all worked out! I’m glad you enjoyed my story and are enjoying the recipes. Thanks so much Linda!! Honestly, I was not expecting much….so few ingredients…wasn’t sure how it would taste. It was sooo good! I put about 2 t harissa and it added just enough kick. Will make this again! Bonus, by husband is on WW and I think that this is 0 points!! I’m so glad you enjoyed it! Thanks Laurie! What a wonderful recipe … so easy to make and so, so tasty! Thank you for sharing this, will certainly make it again soon … my husband loved it as well! Awesome! I’m glad you both enjoyed it!